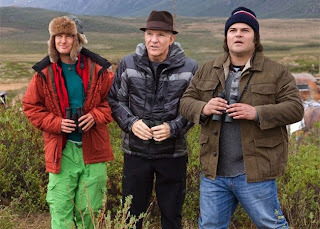 Steve Martin, Owen Wilson and Jack Black in a film about birdwatchers. It sounds like the makings for a wacky, silly film with a lot of outrageous gags from beginning to end. Oddly enough that’s not what The Big Year ends up being. It’s a strange film. With this cast of actors I certainly assumed it would be aimed at the funny bone. Toss in these three comedic actors, a quirky idea and let the laughs commence. But it’s really not so much of a comedy as it is a…..well I don’t know what exactly. The three star as avid birdwatchers who are putting their lives on hold to compete in having a ‘Big Year’; meaning to try to break the record of seeing as many species of birds as possible. Wilson is the current record holder and desperately wants to hold onto his title, even if that means leaving his expecting his wife Rosamund Pike all on her own as he races around the country with his binoculars. Martin is a just retired successful CEO who decides to set his life on hold for an opportunity to focus on his passion. Black is a working class computer programmer who attempts to stretch out his savings in order to compete in this expensive year-long expedition. I really wasn’t expecting much when I sat down to watch this – and I didn’t get much from it. It is an interesting premise. I can’t recall any other movies about birdwatchers. It has the makings of a fun exploration into how obsession can rule over some hobbyists. The film touches on that with the guys dedication to this competition, but the story never really takes off. There’s the typical confusion, anger and support by family members for their adventure. There’s the rivalry that grows between them. Not surprisingly the message for them to learn is not how many birds they can spot, but what really is important in life and all that. All the stars have been better in much more entertaining movies. The Big Year just kind of floats along not building to anything. It mainly consists of a series of mundane adventures to spot this bird or that bird and after awhile it just gets repetitive, with no laughs. I did like the friendship that grows between the super rich Martin and the struggling Black. These two have radically different lives, but their one shared interest of bird watching is what connects them and keeps them together. For a film with such a unique premise it becomes very formulaic. It’s not an awful movie, just very dull. I kept waiting for things to kick in, but they never do. Don’t Save It, Throw It Away!